Horn pommel on Malacca petrol lighter gadget cane. 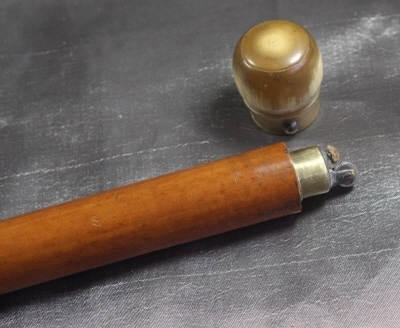 The base of the cane fitted with original base ferrule. Twist and pull the horn pommel and the petrol lighter is revealed. To fill the lighter the mechanism pulls out from the cane. Good original condition free from breaks or cracks yet showing appropriate wear for age.